Building homes with straw-bales is an old and proven technique. The first documented structure was a schoolhouse built in 1896, which was eaten by cows. However, pioneers in the Nebraska Sandhills were undeterred and began plastering the bales. They built 70 straw-bale structures between 1896 and 1945, some of which are still standing. 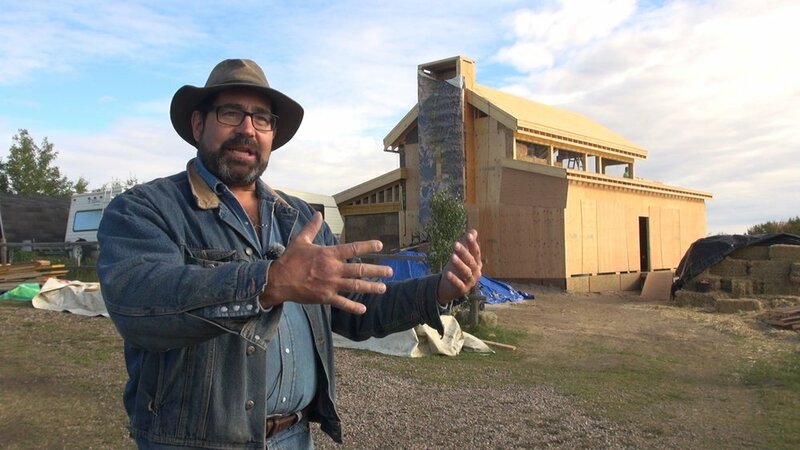 Habib Gonzalez owner of Sustainable Works, has built more than 100 straw-bale homes in B.C. and Alberta. Gonzalez says straw bale appeals to people who are interested in a hands-on approach to home construction. Lance and Wendy Olson wanted to live smaller and reduce their footprint. After many months of research, Lance landed on a couple of ideas that intrigued him: straw-bale construction and rammed earth walls. They got a lot of help from SAIT researchers and Gonzalez. The result is an 800 sq. foot post-and-beam straw-bale home. The home is partially heated by a solar thermal system that uses rammed earth walls that store passive solar energy that streams into the home through a solar porch, similar to the greenhouse in Earthship designs. Heat also comes from solar thermal collectors on the roof, a wood stove where glycol is heated, and a solar PV-powered electric back-up heater. "I discovered the wonderful benefits of straw bale. It’s warm in the winter, it’s cool in the summer"
Straw-bale already offers R35 insulation in the walls, but the Olsons added an insulated exterior wall, sheeting and plaster to reach R57. Straw-bale homes are very strong and fire resistant. The National Research Council of Canada confirmed this through work with the Canadian Mortgage and Housing Corporate (CMHC). Gonzalez was also involved with some CMHC research into moisture issues. They put sensors in 11 houses. They discovered the walls don’t trap moisture, they transpire like skin. Nora Bumanis is the harpist for the Edmonton Symphony Orchestra and she wanted a soundproof home where she could practice. She now lives in a straw-bale triplex in Edmonton, next door to the conductor of the orchestra-and can still practice with some peace of mind. “I discovered the wonderful benefits of straw bale. It’s warm in the winter, it’s cool in the summer, my highest heating bill has been $60 in the last six or seven years,” she says. After a history dating back more than 100 years it’s clear straw-bale occupies a niche market. But it’s hard not to be seduced by the allure of this down-to-earth construction strategy when the homes are so beautiful.